Have you every experienced a Cold Sore? Let’s be honest they can be nasty looking, painful and whenever they appear the timing is never good! 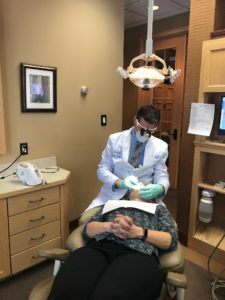 Dr. Gorman using a Diode Laser to treat a cold sore. In our dental practice the diode laser is mainly used in Periodontology, and minimally invasive soft tissue surgery. Many of those affected by cold sores (Herpes labialis) are unaware that laser treatment can successfully alleviate their symptoms, or that this service is offered by The Gorman Center for Fine Dentistry. Within our office most patients felt the symptoms subside during the treatment. All of the patients were satisfied with the immediate relief provided by this treatment and for the majority of patients, the symptoms did not occur again after treatment, although others needed more than one treatment with the laser. The spontaneous reduction of symptoms during and after laser treatment results in a considerable easing of the complaints caused by cold sores (Herpes labialis). Treatment would appear to be more successful the sooner the patient begins with the laser treatment after the start of the herpes outbreak. This confirmed to me that laser treatment of cold sores (Herpes labialis) is a very good way to quickly and simply help patients without any side effects. Contact us to make an appointment that takes less than 20 minutes and can be very helpful in getting you back in public without concerns about your appearance!